Progressive Chat: Watch Notre Dame students walk out as Pence begins commencement speech. Watch Notre Dame students walk out as Pence begins commencement speech. Dozens of students at the University of Notre Dame walked out of their own commencement ceremony in a poignant protest of the administration and policies he represents when chuckly Santa aka Mike Pence took the stage Sunday. 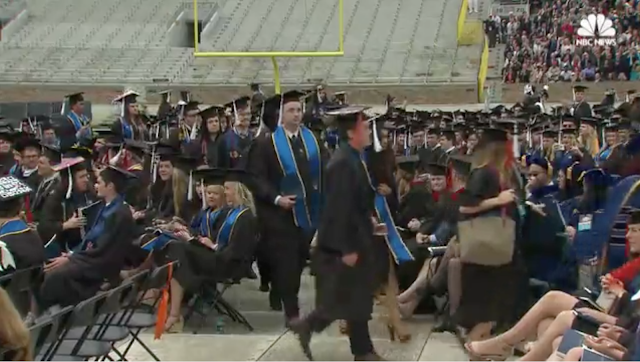 Members of the larger crowd cheered the walk-outs on, as they stormed out of Notre Dame Stadium during the school's 172nd commencement. The walk-out came right before students received their degrees. They were not allowed back in, in the halls per officials. The student organization WeStaNDFor had shared their plans ahead of time, so the protest wasn't not a surpise. They shared that the politics former Indiana governor Pence represented, although raised Catholic, contradicted the Catholic social virtues Notre Dame extols. Bravo kids. Thanks for reminding us you are the future! The only students with class are those that turned their backs on the christofascist Pence and walked out.